I realized that I was able to make turtles of love! Once, I folded few turtles giving them to a special person. Those turtles was the bridge that connected our lives. That's how the story began. Seeing this success, one of my good friends, who wanted to catch the attention of his special person, asked for my help. I folded him a entire family of turtles. Two of them were small turtles about two inches like in the picture above. One of them was a bit larger, about 5 inches. 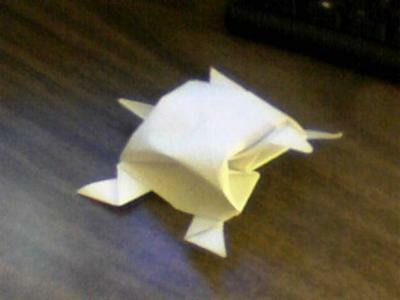 Before I folded the last one, he told me, those turtles are nice but I want something better, more significant. We bought a three feet large paper. I fold a giant turtle with it. It took a lot of effort to fold such a big turtle but I successfully fold it. My friend gave the family to the girl. A romantic story started with my turtles... again. Even today, five years later, all people who got my turtles, whoever gave them, they all kept the turtles. I don't know if it is for keeping a memory of their story or because the turtles are just nice, but they kept them. I learned to fold the turtles of love when I was 10 years old - I found the instructions in a wardrobe. They have been quite useful until now. I didn't find the same instruction anywhere on the Internet, that's why I memorized the instruction and share my knowledge with my friends and family, sharing the magical love of these turtles.